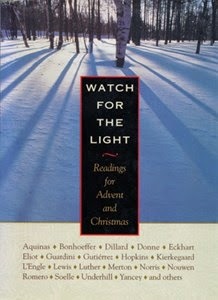 Watch for the Light: Readings for Advent and Christmas is a collection of daily devotions by various writers from different time periods, such as Sylvia Plath, Madeline L'Engle, Dietrich Bonhoeffer, Martin Luther, C. S. Lewis, T. S. Eliot and many more. Dated from November 24 through January 7, these readings take you all the way through the holidays, as they capture the essence of the season. The lessons in these readings are thought-provoking, challenging, deep, and convicting. "In Christ's human life, there were always a few who made up for the neglect of the crowd . . . The women at the foot of the Cross did it too, making up for the crowd who stood by and sneered. We can do it too, exactly as they did. We are not born too late. We do it by seeing Christ and serving Christ in friends and strangers, in everyone we come in contact with" (p. 180-181). This is not a fluffy, lighthearted devotional book. Rather, each reading is substantial enough to make you want to revisit it over and over again. It is not a quick read, both due to the length of many of the selections and to the meaty content that requires some study. If you're looking for a quick Christmas devotional, this might not be for you. If, however, you want to spend some time reading and meditating over the meaning of Christmas, Watch for the Light would be a good addition to your library.